Traced the problem back to the ignition switch. Changed that and I believe the problem is solved. The test light would light up when I put it on the blower fan connection with the ignition off. Traced back along the circuit testing all switches. Still had power to those with the ignition off. The only thing left was the ignition switch. Changed that out and now the test light goes out when the ignition is turned off. I hope that fixed it. I guess I will find out later if the battery is still charged. Once again thanks for all your help. I have a 1977 TA with an LS swap with AC and the blower motor only seems to have 1 speed (low). Reading through this, it sounds like I need some sort of ground to fix this? On some years Max AC was supposed to force the blower to HIGH and as a result, there is a separate wire that powers the fan on Max AC. [Edit] 78's don't have this wire. I think you got earlier model controls and 1978 wiring which doesn't match exactly. If it's anything like that, I think you can jumper two pins on the control head and you'll be okay. The wiring diagram for 78 posted here shows that the control head still has the pin but there's no wire. I noticed the same issue. Did you ever find resolve? I am replacing my heater core and with everything apart now, I decided to test AC, determine if it works and blows cold, if so I will leave alone. If it doesn't blow cold, I might as convert to R134a. .....matter of fact it doesn't spin at all on any setting setting AC, Heater etc. !! 2) compressor clutch is not coming on.... is there a bypass/jumper method that I could do to tell if compressor is o.k.? as the whole heater box under console is out, the only the vacuum small tubes are all disconnected on heater box and kick panel... all wiring is connected. I have 2 wires going to the blower black and brown with rubber boot. and the 2 wires hot and ground going to compressor. If you have low fan speed, then that means that the heater fuse has power. The system gives a lot of trouble, as you can see in this thread. If the blower does not want to work just in max AC, then that sounds like a switch issue on the controller, or a simple wiring issue there between the switches. The mode controller has contacts that allow the blower to run in each setting that is not "off". This is just a simple feature. When "off" the fan drops back to low speed. When "on" the fan switch then gets power, and there is a wire connecting those two, the mode controller contacts to the fan speed switch. From the fan speed switch, there are 3 circuits coming out, so I think that is not your problem. You can check by seeing if you can get power to anything on the resistors other than "low". If the compressor won't run, I would bet you're low on freon. You can check that, yes, by jumping at the evaporator accumulator. You should have power coming there when A/C is selected, so troubleshoot that if you don't. Firebirdparts, thanks for quick reply. I am in the thick of this now working on her. to be sure - "mode controller" - your referring to dash controls? A. low is always on, when controls or off and car running or key in start/run position. Is this correct and acceptable? B. AC MAX setting, blower fan does not operate. Question B1: All others seem to operate fine. Is this because the compressor clutch isn't engaging? The clutch DOES run when I jump it at the accumulator pins. Question C1: Does this mean the compressor is o.k. , and most likely freon is low? Question C2: Can I run it a few minutes with it jumped... long enough to check the freon level with gauges? Sidenote: I have the r134A fittings and newer gauges so I can test. Seemed odd the retro-fittings... high side is in on the accumulator? and lowside on railing leading to evaporator ? E. If freon is low, can I use hotshot or some similar alternative for the time being? ...apologies for the bombardment... I am steadily trying to get her running currently. C: You are low on freon. Do not run the compressor, no need. you can just put the gauges on. if you have 30 psi or more, then maybe it should have come on, and maybe we might suspect the pressure switch. However, I would bet it's low. These compressors leak. DEF: We have had many threads on refrigerant conversion, and of course the conclusions for a Trans Am are not very different from any other formerly R12 car. There are pros and cons of several options. R134A is certainly cheap. R12 is still available reclaimed. The original a/c system will leak. I would say look at some other threads on this. I think an abrupt change to 134A is probably the cheapest option, but you need to leak check with something. Blower motor not work on HI setting. I am at a loss what to do at the moment regarding ? - Take the dash controller out and inspect contacts ? Reading posts and I agree, doubtful it is the blower resistor. Is there a means to jumper to test the blower motor on HI setting? This way the blower is eliminated and VIOLA - it must be the relay? I am trying yo finish my original problem (heater core) but need to make sure the blower motor is fine. I can retro-fit or do whatever with the AC later, but I need to get the heater core done and the car back together. It only leaves the evap not accessible (I figure low risk, chancing the evap will work). You can't inspect the contacts, I don't suppose. You might be able to get some contact cleaner in there. I have never really tried to take that switch apart, so I may be wrong. the switch where it sits on the mode controller should be pretty obvious. What's not obvious is that the MAX AC setting had its own unique contacts. 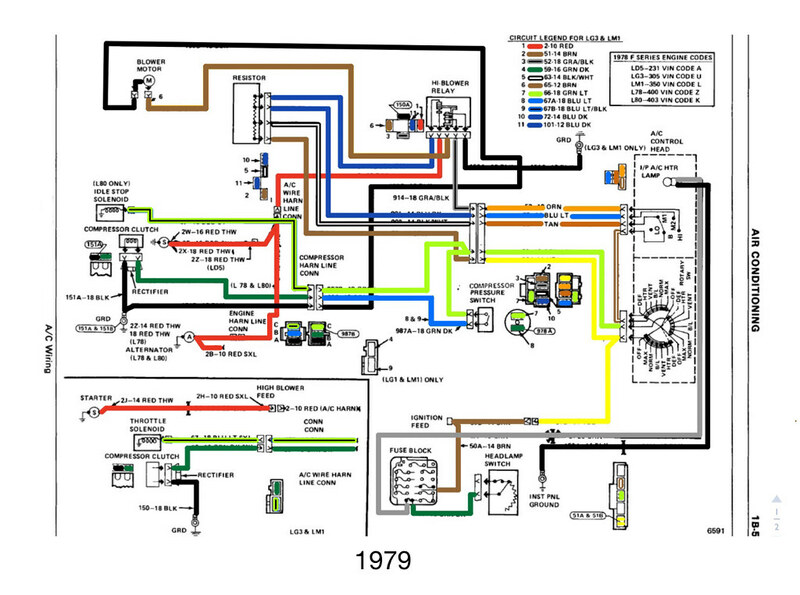 This thread in which you are posting is the sticky wiring diagram thread. You can apply 12 volts to whatever you want to except for the ground wire. If High fan speed is not working, there are a lot of components involved in that. You'd be crazy not to use a volt meter here. You need power on two wires to the relay for it to work. If you get that, then you need the relay to turn on. Your question about a jumper connecting the compressor to the blower: don't. The switch is basic... at first look burnt but its not. there was goo glue that just aged like molasses (how switch was made with adhesive). There is a loud clicking noise in the compressor relay when the HI setting is selected. Doesn't matter the dash setting (heat, AC, norm, etc). Is this really supposed to click loudly on HI only (and not operate)? no other mode selection or fan setting does this. this means power is getting to the relay at least... BUT leaves relay or blower motor as culprit. Almost narrowed down. I have volt meter just need to figure out what 12v to where. ISSUE: the Fan Blower is not working on HI.... All other settings for the blower fan work fine. 2) Blower relay - not sure how to check, check for 12v to and from perhaps. I checked voltages for 12v at the hot wire to the blower. noticed HI fan setting only produced 3.5-4v here. My issue / SOLUTION: Wiring connector !!!!!!!!! clean crimp and di-electric grease. I traced the wiring and discovered a serious voltage drop when set to HI on the alternator hot wire that feeds this blower circuit. See this post for some details on possible other sympyoms leading to same cause/solution. 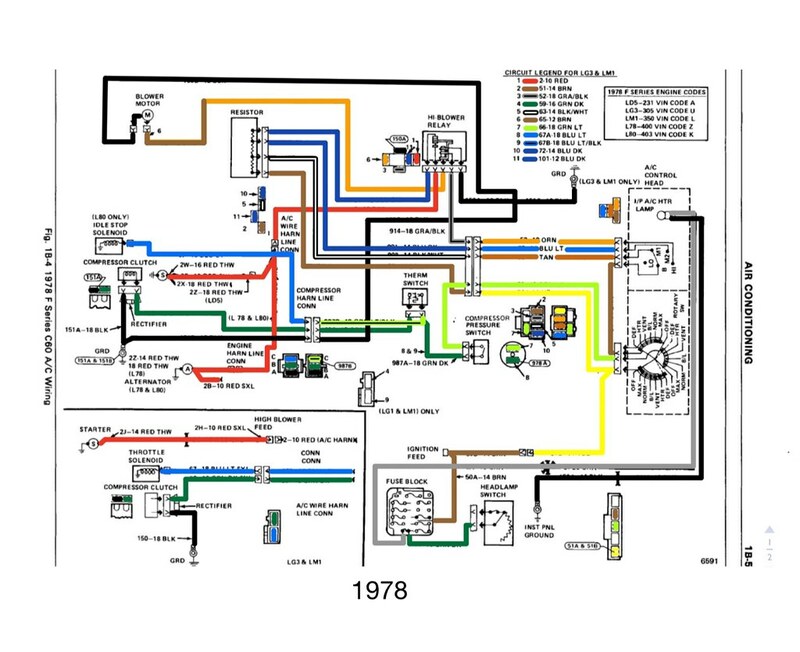 This is a standard wiring diagram for the 1978 model year. It’s just a color version of the one posted in the first post. I have no speed control to the blower motor at all (for the longest time I have everything but High). -I tried replaceing the High blower relay, that didn't fix anything. is this a switch, resistor or something else problem? Many things affect the aircon system. The compressor doesn't turn on, it simply engages and disengages the clutch behind the pulley. For that to even occur the power must have got past the pressure switch (es) meaning there's suitable pressure in the lines for it to operate. The pressure switches can also stick and fail. You can check if you have power at this point by unplugging the pressure switch and checking the plug terminal with a test light when the AC mode is selected. Running off the same feed is the compressor clutch, is it locking and unlocking when AC selected? There's also a live wire running to the carb idle solenoid. If none of these activate then you need to look at the pressure switch or prior. If the solenoid works but not the clutch, run some wires directly to the compressor terminal to test direct. Ok ignore that, not sure where the post went that I replied to....?? Sounds like you blew the heater fuse. Not sure what you meant, there's no Off for fan on an AC model. That's what I meant, even though none of the other fan settings work, the fan still blows on when off. Okay, well, the fuse is not blown if the fan is blowing on low all the time. On the back of the a/c controls, there is a sort of a harmonica shaped connector. If that slips off, it disables everything but leaves the fan blowing on low all the time. So that's my second guess.